October 27th, 3:30PM - Viewconference 2016, Turin (Italy). Akili is a US company that aims to study the therapeutic effect of video games for people with cognitive disorders, such as autism, Alzheimer's, etc. It has developed over the past years some "therapeutic videogames", with the goal of to try to cure this kind of disease, but not only. The approach of Akili is based on the foundation for which, today, we do a lot for our physical well-being: wellness, physical activity, gym, sports, but in general we do nothing to develop our brain that, if we don’t push it and we don’t use too much, it relaxes and loses its flexibility. Too often, to increase our brain performances we use drugs - molecules that increase efficiency or mental capacity - but this often is not enough, or may in some cases be harmful and counterproductive. For this reason Akili wants to use current technologies to improve our mental flexibility: since 2008 it has developed systems called Closed Loop Systems, to test the efficiency of the brain in the elderly people. 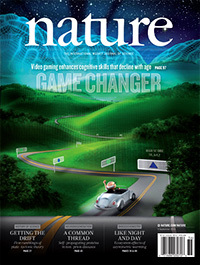 Its research has also been published on Nature (famous scientific journal), which has dedicated a cover entitled "Game Changer". To support their research, they have developed a video game for iPad called "Project Evo", a driving game in which the player, in addition to drive a spaceship inside a canyon must perform a series of tasks simultaneously. Akili’s tests have confirmed that games of this type are excellent tools for diagnose some cognitive problems, such as attention deficit disorders in children. After these discoveries in the use of video games as a diagnostic tool, Akili also created Neuroscape (www.neuroscapelab.com), a research laboratory through which it is trying to prove that many of modern technologies (such as smartwatches, systems such as Kinect, virtual reality, augmented reality, mixed reality) could have effective medical benefits.